Have you ever tried camping in California in the summer without a reservation? I don't know if this applies to the rest of the country too, but people here book campsites a year in advance. I have a hard time booking plane tickets one MONTH in advance, so when Lu and I headed up the coast last weekend, it was without a campsite reservation. Which turned out to be a bit of a problem. We did eventually find a spot, after checking ten or so other campgrounds. It was somebody else's campsite, but they weren't there, and since it was 2am, we figured they wouldn't be coming that night. And quite honestly, we couldn't have found a more perfect spot- it was high up on a cliff, overlooking the Pacific. We built a fire under the light of the half-moon, and ate apples and cheese and listened to the waves and then fell asleep. In the morning, we woke up and watched the sea rolling in. The sea does that up there- it rolls, in these big giant roll-y waves that are covered with kelp. Fog hangs in the air. And far below, you can hear those thunderous crashes as the waves strike the cliffs. Everything was damp and smelled of salt. Every now and then a car would drive by up on the road, but other than that, it was just us and the sea, and the sound of Lu playing the guitar. Coffee. Guitars. Waves crashing. Fog. Bacon. Yes. After a run in with a none-too-happy ranger (I don't blame him- we did arrive unannounced and steal somebody else's spot), we packed up and headed further up the coast. Into Big Sur. Dramatic cliffs, turquoise waters, white sandy beaches, and my little tent by the cool bubbly river under a lovely redwood tree. 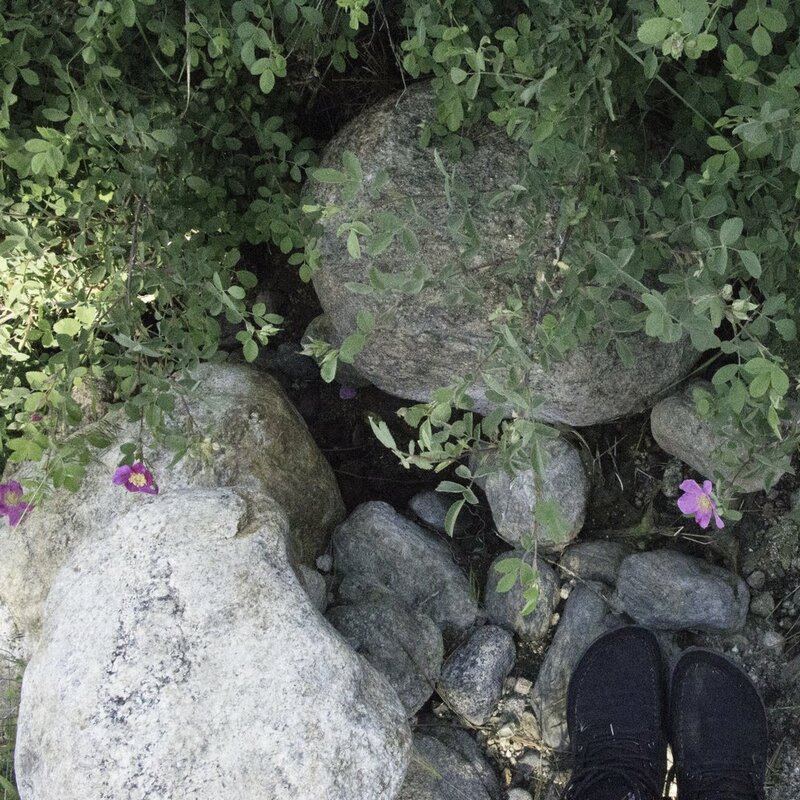 And so we spent a couple of days exploring Big Sur. We climbed up hills, and drove back and forth along the coast going "Oooooooh wowwwww!". We gathered driftwood on a deserted beach. We met a lovely family from India who I built a fire for and spent the morning drinking chai with (delicious chai made over campfire= slightly surreal experience since it's not so long ago that I was actually in India drinking chai and the two didn't fit together very well in my head). And we played on beaches- these unbelievably dramatic beaches. We got soaked. And we dried in the sun. And I got sunburned, and it was well worth it. When I got home, it took 3 days to get the smell of smoke out of my hair. But the most important thing about impromptu road trips, especially the ones that involve sharing wine from a bottle by a campfire, is what to snack on when you are halfway up the California coast and it's lunch time. Luckily, I think about these things in advance. And I packed us a picnic. Tomato tart and fresh ripe plums. I promise this isn't just delicious on a cliff by the ocean. I've had it on my stoop in Los Angeles with the sound of sirens (ambulance sirens not ocean sirens) in the distance and it's just as tasty. The whole thing is inspired by, and only adapted slightly from, David Lebovitz, who wrote about tomato tarts last summer. The toms are just starting to get yummy, so it's the perfect time to try it. In a food processor, place the flour, salt and butter. Pulse until the butter is in wee pea-sized pieces. Add the egg in 2 parts, pulsing in between, and then the cream. Pulsing for five-seconds at a time until it's all incorporated- about five or six times. Turn out onto a work surface and bring together into a ball. Wrap with plastic wrap and refrigerate for at least 2 hours. Roll out the tart crust, and drape over the tart pan- you can just roll a rolling pin over the top, and that will chop off the excess pastry, then press it down on the inside so that it's covering the whole pan. Patch up any holes with extra pastry. Spread the tomato paste over the bottom of the crust with a spatula, and then do the same with the mustard. Slice the tomatoes, and place them over the bottom of the crust, so that as much of the pastry is covered as possible. 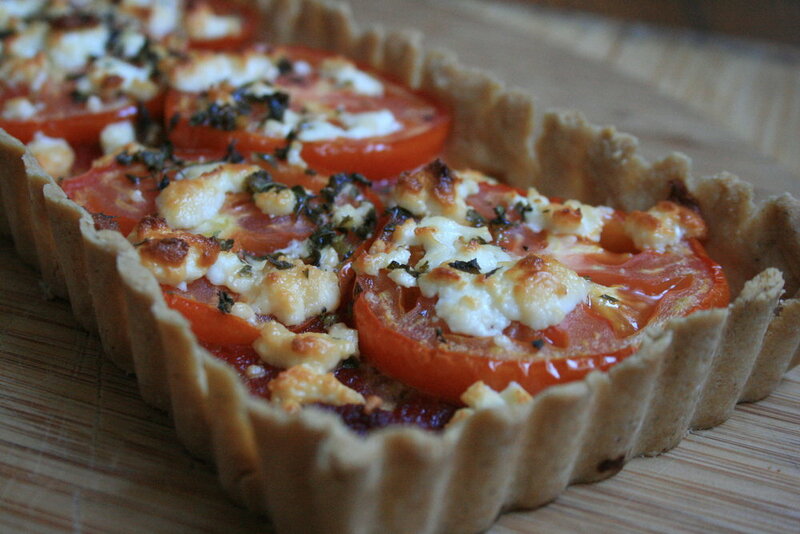 Depending on the size of the tart, you may need more tomatoes. Chop the herbs and sprinkle them all over the top of the tomatoes. Sprinkle the feta over the top, then drizzle with honey and olive oil. Bake for 30 minutes, until the crust is lightly browned and the tomatoes are cooked and the cheese is starting to brown slightly. It's delicious warm out of the oven, and also really good cold the next day. *If you have any plans to visit California, please please rent a convertible and drive up the coast from Los Angeles to San Francisco. It might be the prettiest drive you'll ever do.